If you don’t have a big brother, you have one now with one of the most exciting new bingo sites to hit online. Big Brother Bingo is a showcase of fine entertainment that follows in the footstep of the Celebrity Big Brother show. Now bingo players are in the spotlight so get ready for lights, camera, and bingo. Remember the famous line in the movie Casino: “And the eye-in-the-sky is watching us all”. In the bingo world it is Big Brother Bingo watching us with an eye straight from the sky on the homepage. The mascot is the eye symbol and perfectly represents big brother is indeed watching. The site blends nicely with the hit show and there is an element of feeling like you are on the air. The Community page is quite interesting and visitors of the site should take a peek at this fun section. Partake in polls that relate to the CBB show predictions, blogs, winning stories and On the TV. As part of the Joy of Bingo Network, players can expect the very best in quality gaming along with their sister sites that are among the biggest sites in the online bingo community. If you already belong to a Joy of Bingo site (and who doesn’t), getting started is a snap because no registration is required. Simply sign in and take advantage of all the offers of a new player. The Dragonfish software is one of the most popular gaming developers in the industry and a favorite among UK players. Big Brother Bingo is regulated and licensed by the laws of Gibraltar and are owned by Cassava Enterprises Limited. 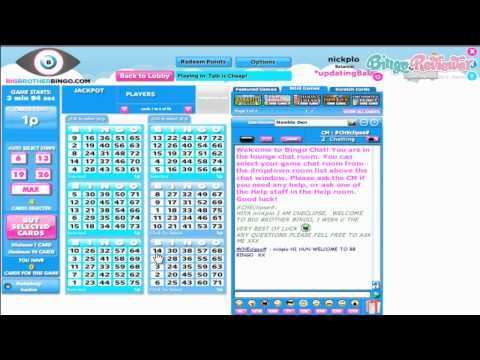 This site embraces all types of bingo players starting with Free Bingo and 1p games for the budget conscious player. The action begins in the 75, 90 ball bingo rooms including a 5 line bingo rooms. The rooms are a bustling 24 hours a day and are ready anytime you are with nonstop gaming. Step into the bingo groove with guaranteed and progressive jackpots that are bursting with cash prizes. Enjoy Swedish Bingo with a winning combination up to 5 lines that are horizontal and diagonal. It is a blend of two most popular games of 90 and 75 ball bingo. The card resembles 75 ball bingo with one difference, there is no free space. Instead of 75 numbers there is 90 numbers in this fast paced game. The Big Brother house has other goodies on store with an array of Slots, Scratch Cards and Casino games to fill your day with a variety you deserve. There is a brother in da house with offers you simply can’t refuse. Newly registered players will have a chance to win up to £20 no deposit required bonus. But to claim it is different from any other bingo site as players head right into the gaming action and play the Stairway to Swag game. Once you are ready to hit the cashier button an attractive Deposit Bonus is all yours for the taking. Just remember the wagering requirements which is 2x your deposit and bonus and only bingo games are eligible for this offer. The Weekly Task is about earning points and carrying out specific actions and competes for top scorer every Thursday to Wednesday for a great prize. Watch the leaderboard to see where you are in the standings. Rumor has it there is a partying going on the last day of every month. The Wrap Party takes place at 7pm and lucky players will have a chance to win Free £25 in bingo funds. Head for the Diary Room where games play every 15 minutes. A weekly and weekend schedule of the latest promotions are available under the Promotions page. You’ll find some of the most exciting and exclusive prizes including tours of the house, VIP passes to evictions, signed Big Brother props and much more. Coinciding with one of the biggest television shows in the UK adds a dimension of familiar fun everyone can relate to. Unique CBB prizes along with the Stairway to Swag create a bingo site worth joining. We rate Big Brother Bingo with 4.25 Pink Hearts. I've always been attracted to the dragonfish software games, so Big Brother Bingo starts out at an advantage with me as far as for my entertainment value. Look out, because Big Brother is Always Watching - and looking for ways to offer new and exciting promotions to their members. So keep a keen eye out on the promotions page so you won't miss out on any of these great chances to win big at this site. With the chance at up to a £20 Free No Deposit Bonus, you will be able to play a lot of bingo and that means either 75 ball, 90 ball, or maybe Swedish bingo is more your style. Be sure to get all of your rules in check as you will hopefully want to make a cashout here and will want it to go smoothly. Remember US players cannot play at this site and there may be others restricted so check out to make sure you can play before getting your hopes up. You can play scratchcard and casino games here and also a large variety of slots are available to keep you spinning happily under the watchful eye of Big Brother. Perhaps you'll hit a nice jackpot-wouldn't that make your day! This is a nice site for the members to enjoy and I hope that you find it satisfactory and profitable for yourself. Good Luck playing at Big Brother Bingo. I am all but a Big Brother TV Show fan, but on the other hand, am a huge fan of good bonuses. Starting with a 200% first deposit bonus (if you deposit at least £5, and that's great since there is a usual £10 limit), and a free Stairway to Swag, and a possible £5 win. Also, a nice number of other promotions is there, and it will take you some time to read it all. This site looks nice and the games are great, and since I haven't played on much Globalcom, this was a nice refreshment. Aside from 75 and 90 ball games, which are rather classic, you can find the 5 Line Bingo, so called Swedish variant, which is one of my favorites. Add the progressive jackpots, and you get the idea what is waiting for you. In case you want something even faster than the 5 line Bingo, you can try the slots or Scratch card games. This site has quite a bit to offer, so don’t be put off by their plain layout. They start you out with a decent welcome offer in which you will receive £20 free when you make an initial deposit of £10. They also give new players the opportunity to receive an additional £5 in extra cash with their unique stairway to swag promo game. On top of this very nice offer, players get dibs on something even better! New players get access to 7 full days of free bingo upon registration which can be accessed in the newbie room. They have plenty of games here as well as daily cash jackpots starting at just 1p. You can’t go wrong with that! When it comes to bingo, they feature the classic varieties, including 75 and 90 ball. Don’t miss out on their awesome promos and which can be found on their “promotions” page.